Quality policy - "ELTUR-SERWIS" sp. z o.o. The high quality of our manufactured products and delivery of comprehensive services, combined with personnel safety and environmental care, is guaranteed by the Integrated Management System compliant with the following standards: PN-EN ISO 9001:2009, PN-EN ISO 14001:2005, PN-N-18001:2004, and PN-ENISO 3834:2-2007. Additionally, the Company implemented Factory Production Control compliant with the requirements of the PN-EN 1090 standard. 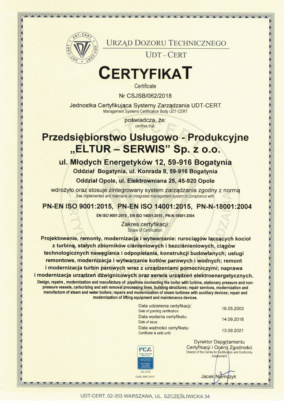 The system is certified by the Warsaw-based Office of Technical Inspection (UDT-CERT). In 2003 the Company implemented the Integrated Management System that complies with the following standards: PN-EN ISO 9001:2009, PN-EN ISO 14001:2005, PN-N-18001:2004, and PN-EN ISO 3834:2-2007, enabling the Company to deliver services at the highest level. 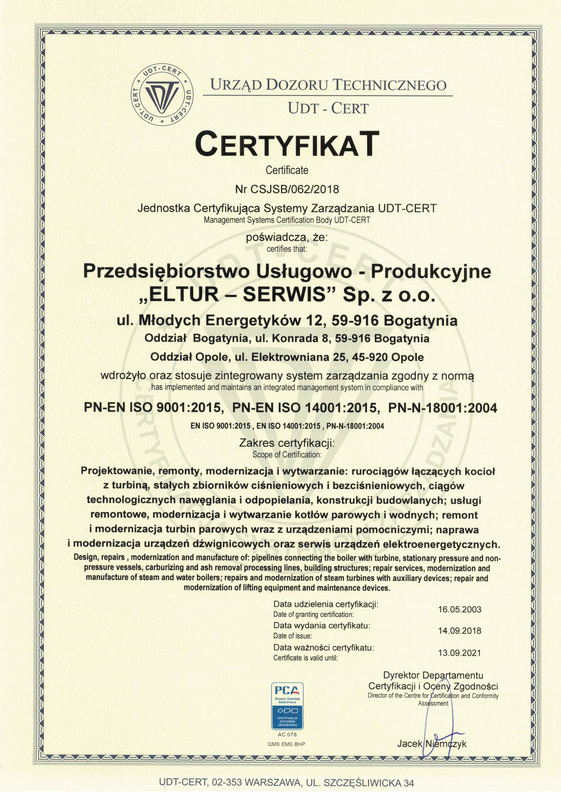 Additionally, in 2014 the Company was certified for compliance with the Factory Production Control (FCP) system in adherence to the PN-EN 1090 standard. 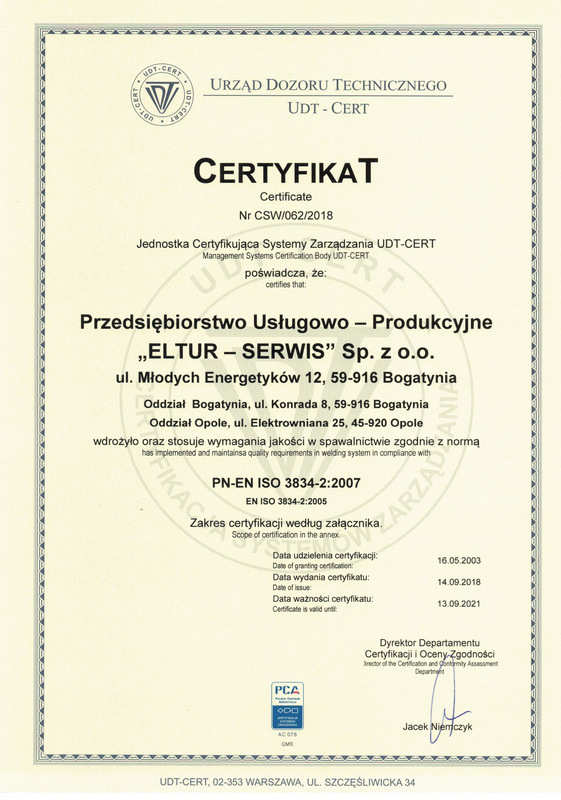 Certificate No. CSJSB/062/2006 certifies the compliance of the Integrated Management System with the requirements set forth in the following standards: PN-EN ISO 9001:2009, PN-EN ISO 14001:2005, and PN-N-18001:2004. The Certificate of the Quality System, certifying its compliance with the requirements set forth in the PN-EN ISO 3834:2-2007 standard. 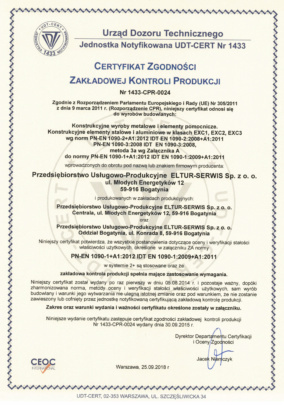 The Certificate for the Factory Production Control (FCP) system, certifying its compliance with the PN-EN 1090 standard. 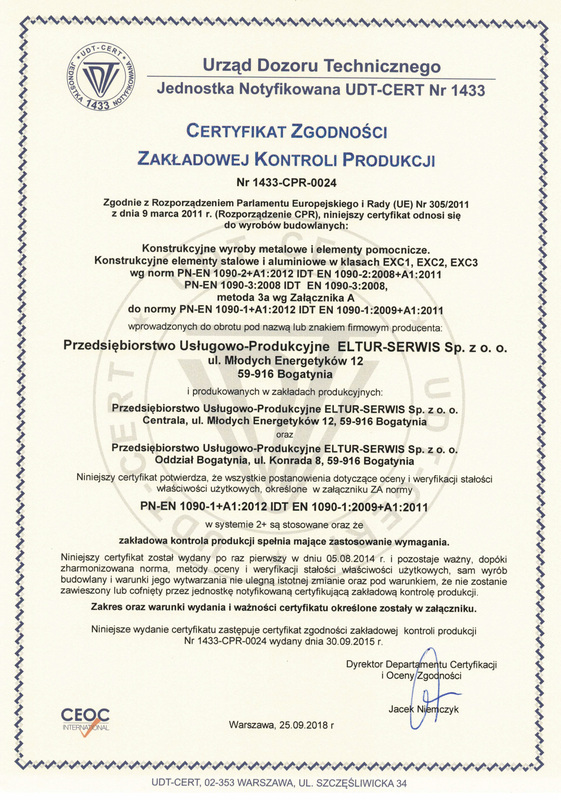 Appendix to the Certificate for the Factory Production Control (FCP) . “ELTUR-SERWIS” Sp. z o.o. has also implemented the Quality Assurance System at the Destructive and Non-Destructive Test Laboratory, which complies with the PN-EN ISO/IEC 17025:2005 standard.